Best Travel Shoes, Travel Sandals, Walking Shoes and Hiking Boots – If there’s one thing you can’t leave for your next vacation without — it’s travel shoes. And given that, when traveling, you probably walk a good deal more than usual, it’s critical to have the best travel shoes and travel sandals. So, we’ve compiled a list of what to look for in the best travel shoes so you know which traveling shoes to pack. For 1) and 2), you may be fine with a pair of flip flops. Flip flops are easy to transport and relatively inexpensive making for great shower and beach shoes. For 2) (beach, if lots of walking) and 3) (someplace warm), you’ll want a comfy pair of walking sandals. Walking sandals with wrap around straps (forcing your foot to press against your foot, unlike a flip flop) are a better choice. Depending on your dress style you may want something fancy in travel sandals. In terms of brands, I used to recommend Birkenstocks but have had some terrible quality and customer service issues. I had the strap fail and separate from the sandal after just 6 months of light wear. I do not recommend anymore; and Kimberly prefers Tevas and Chaco sandals, which are known for their durability and comfort. If I were going to buy a pair of walking sandals today it would be either Chacos or one of the following brands: Keen, Uggs, Clarks, Born, Mephisto, Hush Puppies all have good comfortable dress sandals that will also be good for walking. If your destination isn’t 90 degrees and hot, you’d probably prefer a pair of close toed extra comfortable travel walking shoes (like the Propet Women’s Travelwalker II). Depending on your travel plans and amount of luggage, you may want walking shoes that double as hiking boots or travel walking shoes that double as dress shoes. That said, your best best might be to invest in a good pair of hiking boots (like the Keen Targhee II or the Moab Ventilator) and a small cute pair of flats (like the Bloch London) Arabian Ballet Flats that don’t take up much room in your suitcase. If you’re looking for walking shoes that double as hiking boots, look for a pair of low cut hiking boots. For Argentina I purchased these Merrills (the Moab Ventilator) and love them. Kimberly bought some Keens and loved those. We wore these shoes regularly for both hiking and city walking. There are a number of great brands of hiking/walking shoes, the trick is to find a pair that fit well. If you want travel walking shoes that can double as dress shoes, there are a few brands that turn up comfortable walking shoes that look nice enough for a fancy restaurant. Check out: Ecco, Mephisto, New Balance, Rockport (men) as they all get good reviews for fancy, yet comfortable, walking shoes. I’ve been wearing my Keen Women’s Shoes (Mary Janes) and they are perfect for this. How much hiking you’ll be doing should influence what kind of hiking boots you’ll need. If you’re doing day trips or low-intensity overnight trips you might be able to get away with a pair of low cut hiking boots that can double as your walking shoes. This is what we did in Argentina and it worked out very well. Plus, it saved a lot of space in our luggage. If you’re planning on a lot of hiking, you’ll want the best hiking boots money can buy – with plenty of ankle support. These boots will be taller and bulkier, but the last thing you want is a twisted ankle, 3 days trekking into the Alaskan wilderness. Try on many pairs of tall hiking boots to find a pair that fits well. 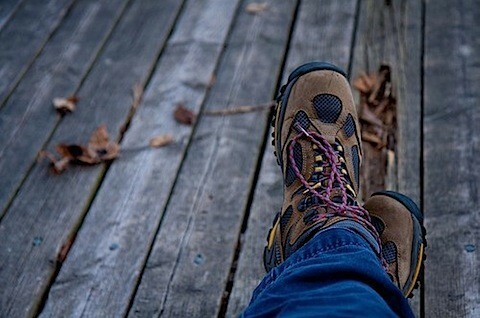 Potomac Appalachian Trail Club has a great resource about finding hiking boots that fit. Shoes are difficult to buy online because you can’t try them on. But, you can get better prices. There are a lot of reasons to buy shoes online and a lot of reasons not to. Here’s an experience I had trying to buy hiking shoes just a week before we left for Argentina. A previously written but unpublished post. I knew I had a pair of hiking boots. Somewhere. They served me well during a 3-week backpacking trip in Poland years ago. After digging around for them, I found my trusty Merrells tucked away in my parents’ garage. A few seeds in them. And what else… chewed up padding. Apparently a mouse had found the hiking boots before me. With only 3 weeks until my departure (and 1.5 until my move) and 45 minutes from the nearest REI, I knew I had to act fast. After pouring through hiking boot reviews online I still couldn’t decide which pair to buy. I knew I wanted Merrells. Mostly because I knew what size I wore in them. But there are probably 50+ Merrell hiking boot options. So I slowly but surely narrowed the choices down. While this takes its toll on the environment because of shipping, the stress it saves me (plus the long drive to REI) certainly pays off. But then there’s the problem of costs. Shipping costs a lot of money. Thank goodness for Zappos. I ordered all three pairs of shoes on Tuesday. Free 4-6 day shipping was included. Lucky for me they upgraded me to free overnight shipping. Woo-hoo! Wednesday I received all three pairs. I tried them on. The $90 pair slipped off my feet. They were sort of elasticy. The $115 pair was really heavy. Plus, they are made of Gore-Tex which, for environmental reasons, I’m on the fence about. The $80 were very comfortable. They were soft to the step. Plus I think they are the best color. I’d heard good things about Zappos (like this story about Zappos sending someone flowers which I still am so impressed by). But now I’ve experienced it for myself. I will definitely shop there again since it makes my life so much easier. Everything you needed to know (and more) about the best travel shoes, travel sandals, walking shoes, and hiking boots, plus where to buy them online. Update: I have also heard good things about Endless, which also offers free shipping. I stumbled upon Simple Satire ecoSNEAKS two years ago during my search for an environmentally-friendly alternative to my beloved Vans tennis shoes. I wanted shoes that were more durable than the Vans, but as attractive. I was even willing to sacrifice the awesome velcro, but only for the right eco-friendly shoe. Then I saw it: the Simple Satire, a member of Simple’s ecoSNEAKs line. I quickly ordered the black hemp version (they also come in leather, silk, and suede) and eagerly awaited their arrival. I ordered black because, of course, I wanted something I could wear with almost anything. If I bought another pair, I would look at other varieties as well. I was happy when I opened the box: the shoes were cute and looked durable. I slipped them on and promptly wore them as I walked the monuments in Washington, DC. The 5+ mile walk was quite the initial test, but I wasn’t as excited as I wanted to be. I wanted to love them. I wanted them to be my go-everywhere, perfect travel shoe. But I found them less comfortable than I hoped; specifically, the sole didn’t have enough cushion. It almost felt like I was wearing flip flops. The ball of my foot had virtually no support. And my arches were completely unsupported. I hope Simple has improved the “pedbed” in newer editions of the shoes. Lacking arch support – my Vans lacked arched support so I was expecting this and also okay with it. Would I recommend the Simple Women’s Satire? Yes, I would — for everyday wear. If you’re walking more than a couple miles, I’d stick with traditional tennis shoes. I also wouldn’t recommend them as being your sole (no pun intended) travel shoe, since they’re a bit heavy and not as comfortable as other travel shoes I’ve tried. For that, I’d recommend a more supportive hiking boot. 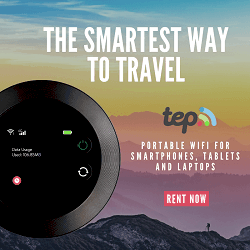 Check out Best Travel Shoes: Travel Sandals, Walking Shoes, and Hiking Boots plus Zappos Review for more travel recommendations. But these are cute and while I’m not one to follow the trends, they are trendy. The Simple Satire ecoSNEAKS are a fun addition to any wardrobe. Quality footwear is essential when you’re hiking around new cities for six hours every day. ecoSNEAKS are made of organic cotton, recycled paper pulp, and old car tire, which makes for a pretty sweet pair of sneakers. I just tried out a pair of Timberland Madison Summits on an extended trip and loved them. They look decent – brown oxford ‘nubuck,’ have a lugged sole, and probably most importantly a removable insole (Timberland’s “Smart” system, they call it). Very light, rugged, and comfortable. This is really handy. Thanks for posting! @ kt – Good to hear about the Timberland Madison hiking shoes! @ ThreePaths – Of course! There’s not much online in terms of help and for choosing travel shoes so I’m glad you liked it. I bought a pair of Flexi hiking boots when I was in Cabo San Lucas. They are the most comfortable shoes that I have ever owned. They also make sandals, along with an entire line of men’s and women’s shoes. There is not many places in the US that carry them, but I did find an online source for the Flexi brand at shoebeedo.com. They are great shoes for walking, hiking or just generally being on your feet all day. Great site, lot’s of good info. Thanks for your posts. I was very encouraged to discover this site. I wanted to thank you for this special read. 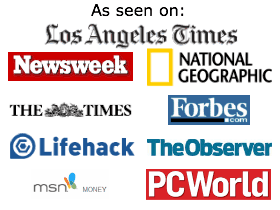 I undeniably savored each tiny bit of it and I include you bookmarked to check out new stuff you post. I read your review, and was really surprised that you didn’t mention the fantastic hiking sandals by Source. They are so comfortable, they include state-of-the-art technology, and Source are really into Eco-friendliness and helping the community. Traveling and shoes must be the most difficult to balance between the weight of carrying and having suitable shoes for the many activities you find yourself in during travels. My travel bag, includes, one pair of flip flops, a strong pair of walking sandals with enough room to wear socks if I need and a reasonable pair of shoes for going out. Anything more than that and you are carrying excess weight and problems for your self. Actually, I walked Rome for three months in a shoe rather similar to your Keen MJs: Earth Naturals’ Britney 2. Well, rather, the variation of that style that was produced 3 years ago, but I was delighted to find it again in a new incarnation so I can wear it until it’s worn straight through the sole again! Of course, they say “environmentally considerate practices” but never bother to explain what exactly that means. Suspicious. I’ve done a ton of traveling. Personally, I usually bring two kinds of footwear on trips: a pair of high-quality sandals (almost always Teva) and a pair of day hiking boots. The reason for the ‘day’, or low hiking shoes is that they’re light-weight and can still be put in my bag when I’m wearing sandals. Traveling with mid or high boots would be too cumbersome as they’re heavy and take up too much space. Nice article. I’m all about Rockports and New Balances. Not too crazy about Birkenstocks however! The only think I look for while choosing shoes for a trip is the comfort. I know there are other as important factors like durability but I want my feet to feel good so that I can walk more without fatigue.